As a nested form of sovereignty, infrastructure is a medium of information, inhabiting invisible but powerful activities, which determine how objects and content are organised and circulated. It is an operating system for shaping the modern city and also a weapon for the most powerful, which orchestrates activities that can remain unstated but are significant. In his Spaces of Hope, David Harvey claims that spatial form controls temporality and an imagined geography controls the possibility of social change and history. This statement opens up debates about spatial forms of utopianism, which negatively treat the city as a container for social action, and restrain the idea of utopianism most generally to the scale of the city. Under what conditions can the dynamic production of space be explored within spatial utopianisms? Today, visionary consumerist utopias are the only realised spatial utopianisms, perfecting capitalism and its present consumerist forms of order. The collapse of socialism has left no plausible alternative to capitalism’s global dominance and it’s neo-liberal brother. The green movement is absorbed by capitalist enterprise, and encouraged through tax incentives and government subsidies of new, green industries to expand its dominant role. The lack of green utopias in 21st century in a time increasingly obsessed with environmental issues may be due to capitalism’s success and unchallenged dominance. Citadel is a speculative proposition for ecological, alternate mechanised cities in transit, evading the pervasive authority of infrastructure space, as well as class-related gentrification processes. 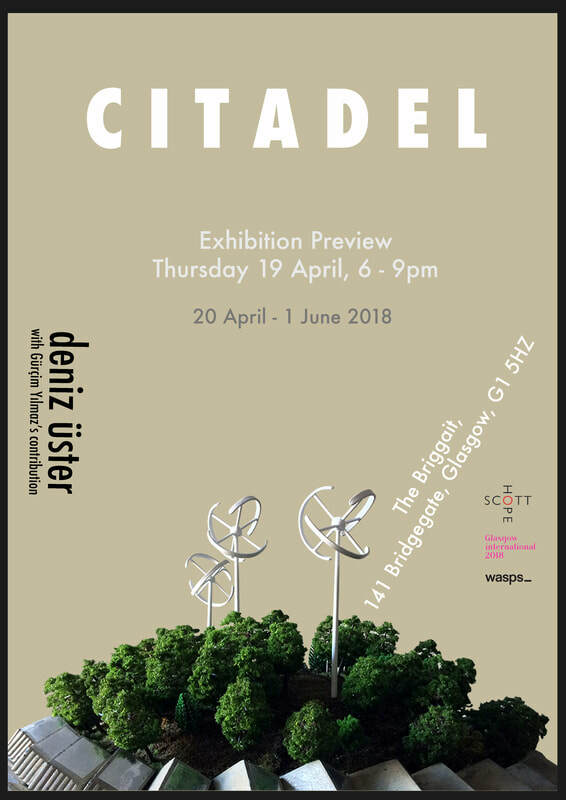 The exhibition consists of an installation including a scaled model of a moving city; an audio piece authored and narrated by Gürçim Yılmaz, providing a background to the emergence of mechanised nomadic living and a transition to cyclical temporality; drawings depicting historical and current displacement projects on Citadel’s route from Istanbul to Glasgow; and a discussion event on Scotland’s Community Rights to Buy Land. The 1960s witnessed Ron Herron’s idea of ‘Walking Cities’, which were conceived as ‘arks' that would provide post-apocalyptic protection to surviving communities, as a response to the perceived threats of the Cold War era. As opposed to Herron’s revolutionary attitude, Citadel depicts a slowly-evolving anarchist utopia, having occurred as a consequence of automation in production and the changing course of technology. Settled life -the reason behind the emergence of the elite- is transformed into nomadic living through the evolution of citadels, which briefly employ the permanent urban landscape exclusively for culture interchange and temporary work opportunities. The education system becomes spherical, spirals and inclusions replace intersections, and angular social structures dissolve within the curves of non-linear, cyclical temporality and spatiality. The act of walking - a trademark of the notion of progress, eventually conveys metaphors of recurrence.